Fees commission report rejected - Activate! 2017-11-21 /0 Comments/in Activator Opinions /by Activate! The youth of South Africa is once again failed by the government of the country. This comes after the report of Fees Commission released by uBaba kaDuduzane, the State President, Mr. Jacob Zuma. It is not alarming that this commission would take its time to ponder on the concept and come up with an undesirable verdict (or finding) to the youth of this country. ‘’Black man (and young Black South Africans) you are on your own’’ – Steve Bantu Biko. For far too long we were misled by the ANC government that #FreeEducation is feasible and will be implemented. It is not a secret that the commission that was established by the ANC has openly declared no confidence in the models suggested by young, innovative South Africans. The year 1996 was when the Truth and Reconciliation Commission (TRC) was assigned to usher justice to South African Apartheid victims, it lost its mission, and failed the victims. We have witnessed white people march under the false pretense of #BlackMonday where they went as far as to publicly venting on their apartheid support by waving an apartheid flag as a symbol of support for the previous regime. This is a vivid demonstration that the apartheid legacy is alive and kicking. I recall very well when Mr. FW de Klerk refused to appear before the commission (TRC), calling it all sorts of names, including ‘circus’ but what is more alarming is for the proclaimed democratic government to keep ‘shoosh’. We again had the #MarikanaMassacre commission of enquiry that was assigned to bring the perpetrators to book, but I can tell you that after five (5) years, to date, there is no one who is held accountable of the killings. Our parents where striking for a living wage, a wage that would fund and feed their children. A wage that would fund education so to pursue the dream of their children, a wage that would bring dignity to them, a wage that would bring dignity and warmth in their homes. Our parents were not only refused the wage increase but were murdered, massacred, hunted and brought to death by the State Police. This is the same state that makes education a commodity in our country and send police to vanguard the private sector. Where are we supposed to get the money from if we cannot demand it from the people who employ Africans? This Commission has not brought any justice to the widows, but failed them. 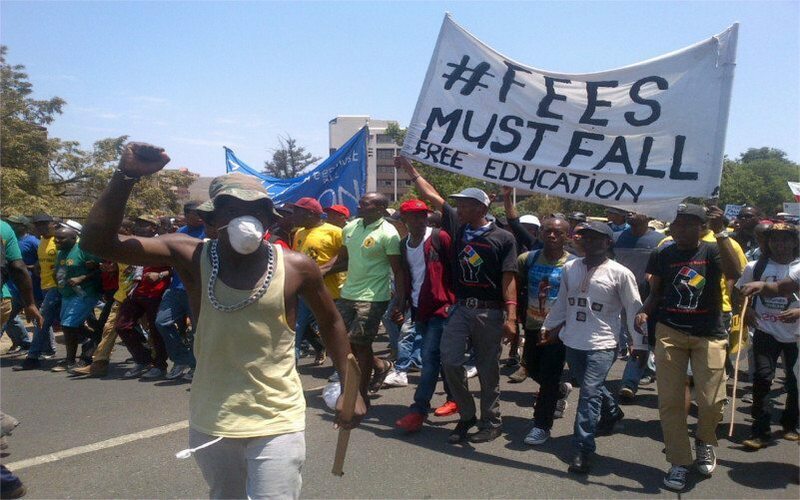 The year 2015 is the year when young poor masses woke up and decided to protest for Fees to Fall. This is the year when there was a fire across the borders of South Africa. This is the year when the undying spirit and ideas of Bra Steve (Steve Bantubonke Biko) kicked, when the bones of the black man shook on his grave because young people were one and were declaring unity amongst themselves, the unity of these young people forced the state to consider bringing free education in this country. The State head, uBaba kaDuduzane then established the Fees Commission to investigate the feasibility of Free Education in SA. Again this State brings a commission, a third commission. This is the commission that also brought a dissatisfactory report to the young people of South Africa, a finding that #FreeEducation is not feasible in South Africa. Kuyoze kubenini umntana omnyama ekhala?! For how long will the youth of South Africa act blind towards this government, this is the government that does not prioritise the interest of young people. Young people must start to learn one thing; and that is to form their alliance and work on building each other. The youth of today must learn from the generation of 70s when it did not allow the government to sideline their interests. If it is not now, then it will never be! We are being sold an education that was said to be the key to success by the first black President Ntate Nelson Mandela. This government taxes our parents and never funds us in the higher education. What kind of a government that suggests us to make loans in private banks? The government that has no alternative to fund us so we can build this country. If this government is keen on building this nation, why is it that it cannot invest in the interest of young people? Young people outside are hungry for education, but how will education be attained if we have to pay exorbitant amounts of money, and the same government does not provide sustainable jobs and/or decent wages to our parents? Who is fooling who here? Who is the future of this nation? Is it us or there is no future for this nation? Enough with the questions, and protest young people, superior logic must prevail now and work on a solid plan for us. Let us not allow the politicians to grab us into their political pockets, although it seems that if you do not have the power you are nothing. Here we form two thirds (2/3) of the country’s population. We have power in every form, we can vote or chose to abstain from voting. But it seems that the economic strategic sectors are ran politically, and these sectors are the ones that can bring solutions to our issues. Suffice to say; young people are the best to assimilate Lenin’s behests. The Fees Commission report should be rejected by all poor young masses and action be taken without wasting anytime.